The iPad triggered a wave of innovation amongst manufacturers desperate to latch onto the next big thing, and as a result we've seen some strange devices chuckedup, one of the latest being Dell's Inspiron Duo convertible tablet. A cross between a netbook and a tablet, we ultimately buy into Dell's vision, but in its first incarnation the Inspiron Duo doesn't quite convince. This is how the system works. 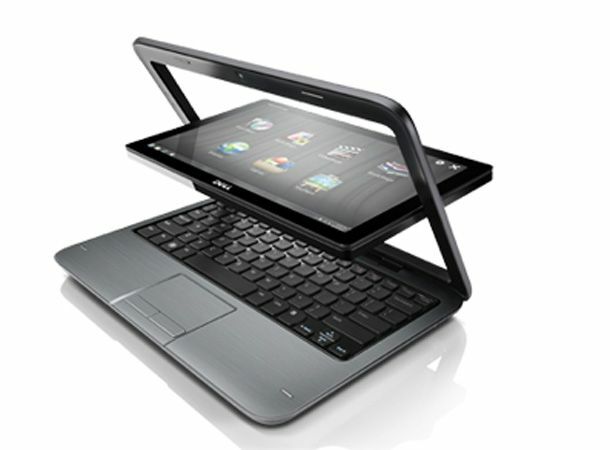 In netbook mode the Inspiron Duo functions very much as you'd imagine. The 10.1-inch touch screen boasts an extremely detailed 1366 x 768 pixel resolution that makes it ideal for viewing multimedia on, and colour vibrancy is also great. The spacious keyboard is a joy to use, and we had no problems typing away for long periods of time – in fact it's fair to say you'll forget you're using a netbook at all such is the comfort. General build quality is a cut above the rest, and the Inspiron Duo will survive the odd bump and bash on the road. Power is courtesy of a dual-core Intel Atom processor, but frankly performance was just as sluggish as we'd expect from a netbook, even despite the 2GB of memory on board. All pretty standard, but it's when you rotate the screen panel horizontally and shut the Inspiron Duo's lid, converting it into a tablet, that things become interesting. At this point Dell's 'Stage' user interface comes into play, with mixed results. This tries to make using Windows 7 more intuitive by using large icons for accessing your multimedia, games and even an eBook reader. The problem is that the capacitive screen is slow to respond and the Intel processor just doesn't have the power to ensure smooth running. On top of this the software features a few design quirks, including the fact that you can't travel back through some of the menus, which seems mad. This may not put off those that have never used the ultra intuitive iPad, but those that have will wonder if they're missing something obvious. They're not. Other strange design choices include the lack of an Ethernet port for wireless networking, while there's no video out of any description, so sharing your content on the big screen is impossible. Rubbing salt in the wound is a poor battery life – and we'd expect more than 215 minutes from both a netbook and a tablet. The concept is bang on, and were we in the market for a convertible tablet this is what we'd go for. Unfortunately the Stage software isn't there yet, while poor battery life and connectivity doesn't help.